Micheál Ó Conaire, Príomhoifigeach, An Roinn Ealaíon, Oidhreachta, Gnóthaí Réigiúnacha, Tuaithe agus Gaeltachta, Bernadette Mullarkey, Cathaoirleach Ghaillimh le Gaeilge, Conor O’Dowd, President of Galway Chamber, (Gradam Sponsor), Declan Varley, Group Editor of the Galway Advertiser (Main Sponsor of the Gradam) and Mayor of the City of Galway, Cllr. Noel Larkin attending a press event in Ionad na Faiche Móire/Eyre Square Centre to announce Gearrliosta Ghradam Sheosaimh Uí Ógartaigh 2017. Next Monday night (May 15 ) Aire Stáit Seán Kyne TD sa Roinn Ealaíon, Oidhreachta, Gnóthaí Réigiúnacha, Tuaithe agus Gaeltachta will announce the Gradam Sheosaimh Uí Ógartaigh category winners and the overall winner for 2017. Twelve Galway businesses on the Gradam Gearrliosta, are very busy preparing for the special awards ceremony taking place at 6.30pm in the Salthill Hotel. This event has become an important feature in the Galway calendar and this year, it will mark the pinnacle of Gaillimh le Gaeilge’s celebrations of 30 years in business. 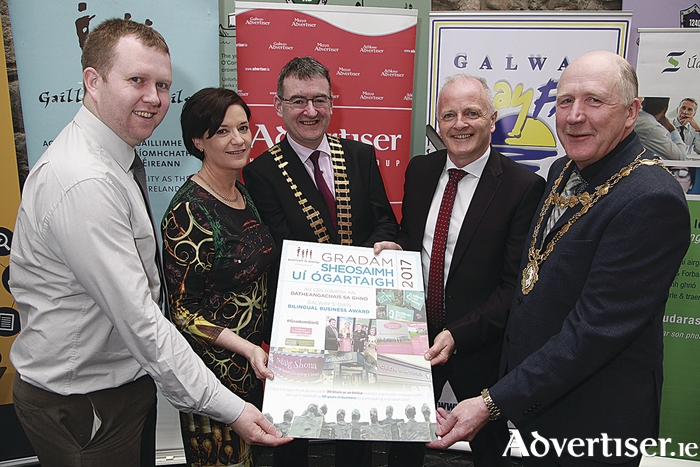 Gaillimh le Gaeilge has organised Gradam Sheosaimh Uí Ógartaigh, for the past 15 years in association with the Galway Advertiser and with support from the Galway Chamber, which celebrates the outstanding efforts of the business community in Galway that use the language in their business. This year’s Gearrliosta features a wide variety of businesses from a poitín distiller to a co-working space who all have one thing in common - they have embraced bilingualism into their business! The Gradam Gearrliosta will have an opportunity to showcase and celebrate all of their bilingual endeavours to a host of guests, family and friends as well as business colleagueson the night. The winners will remain a closely guarded secret until Monday evening when the announcements will be made! Keep up to date with all the latest news and developments on Gaillimh le Gaeilge’s Facebook and Twitter pages. You can also visit Gaillimh le Gaeilge’s YouTube Channel to see a short video of the work of the Gearrliosta. Cross Street Dental, Lorg Media. In the Other Companies category, urraithe ag Acadamh na hOllscolaíochta Gaeilge, OÉ Gaillimh, the finalists are: Carey Building Contractors, Micil Poitín, PorterShed, Siopa Leabhair Uí Chionnaith. The category winners will receive a business package to the value of €2,000 from the category sponsors. The four category winners will also receive a replica of Gradam Sheosaimh Uí Ógartaigh sponsored by Údarás na Gaeltachta. The overall winner of Gradam Sheosaimh Uí Ógartaigh will be selected from the four category winners and will receive an Advertising Package to the value of €2,000 from the main media sponsor of the Gradam, the Galway Advertiser. They will also receive a publicity package with TG4, a series of 4 Web Strategy workshops sponsored by ARÓ Internet Business Development and one year’smembership of Galway Chamber and Gaillimh le Gaeilge. The overall winner will also receive the much sought-after sculpture by renowned artist Pádraic Reaney, depicting the fourteen tribes of Galway resting over the River Corrib, with one extra tribe outstanding, who symbolises the winner of Gradam Sheosaimh Uí Ógartaigh, and future winners to come. Gaillimh le Gaeilge would like to take this opportunity to say a ‘Míle Buíochas’ to all those who took part in this year’s Gradam Awards. ‘Míle buíochas’ also to their valuable sponsors for their continued support and commitment to the Gradam. Tá buíochas tuillte chomh maith ag Moltóirí Ghradam Sheosaimh Uí Ógartaigh i mbliana. They are; Professor Ciarán Ó hÓgartaigh, Dean of UCD School of Business, Clíona Ní Mhurchú, Regional Manager with Top Oil (winners of Gradam Sheosaimh Uí Ógartaigh 2016 ), Sonya Nic Lochlainn, Bainisteoir Seirbhísí Corparáideacha, Údarás na Gaeltachta and Tony Barrett, Director of WestBIC. Ba mhaith Gaillimh le Gaeilge buíochas a ghabháil leis na hainmnithe ar fad a ghlac páirt i nGradam Sheosaimh Uí Ógartaigh i mbliana agus gach rath a ghuí ar an nGearrliosta!